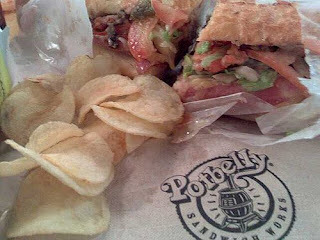 My sister is a strikingly beautiful lady, who eats Potbelly sandwiches seven days a week, only taking a break if Bagel Bites are available. Last night, I went to Craft. I never thought I would say that, but it's true. 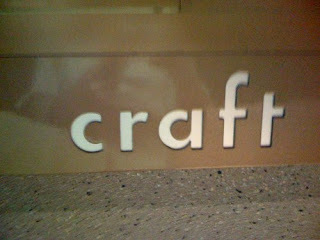 During the brief time that I lived in Los Angeles, Craft was moments from my office. I would drive by with envy, as I headed it 'In & Out Burger' for my version of dinner. Now living back in Dallas, my office [my bosses office] happens to overlook Craft dallas in the W hotel. Although I usually enjoy a one-minute dinner of bagel bites at the office, last night was different. A friend and I wanted to be fancy, so we decided to 'grab dinner' at Craft before the John Mayer concert. There is nothing to 'grab' at craft... each morsel is suitable only for savoring. Like most restaurants, they started us off with bread. We ate it all, considering we didn't know what to expect from the portions at these fancy places. Next came a complimentary fennel and pancetta soup, served in a shot glass. It was a potato soup pureed by angels. I was pleasantly surprised with my glass of Joseph Carr Cabernet. I guess I shouldn't have been surprised. It cost more than the entirety of my usual bottle of wine. Our surprise dishes arrived all at once, served family style in the middle of the table. The big eye tuna, which didn't taste much like the chicken of the sea, was delicious... diced, with some avocado goodness on top. A fantastic arugula salad paired well with the tuna. My sister has educated me on arugula, so I think I sounded smart when it arrived. We had two remaining side items. One looked like mac and cheese, the other looked like grits. Literally, grits in a pot. As it turns out, the 'mac and cheese' was Ricotta Cavatelli & Butternut Squash. The 'grits' were in fact Stone Ground Polenta & White Cheddar. Although both were absolutely fantastic, i liked the mac and cheese best. We were somehow suckered into ordering desert. We decided on the Saffron Cake, Meyer lemon Compote & Almond Honey Ice Cream, which was preceded by another freebie. I have to say, that the freebie was my favorite part of desert. The white chocolate pancetta topped with some sort of orange sorbet was much more tasty that the bitter pound cake with seeds on it. It was the classiest dreamsicle I've ever had. 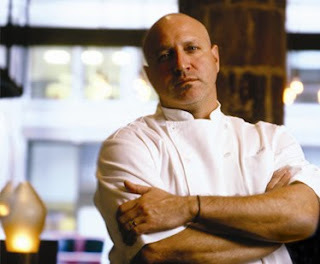 Overall, it was an amazing dining experience, crafted with excellence from beginning to end. *I have been informed that these 'freebies' are actually a common practice in fancy places called an amouse bouche.